Baby Sanari Muthumali who was symbolically chosen as the Lankan baby who reached the seven billion world population mark had to go through pain despite making the nation proud. Notwithstanding protests from her family, the one day-old baby's ears were forcibly pierced by a matron at Castle Street Hospital (on Monday) after being ordered to do so by a woman visitor. She had shouted at the family that the pair of earrings was a gift from a VIP lady and that the baby should wear it before being discharged from the hospital. The agony for the family did not end at that. The infant's father, Ishara Madhushanka was kept away from the ceremony as the hospital guards prevented him entering the premises. He was told "there is a function in progress' and he cannot be allowed inside." The Janatha Vimukthi Peramuna (JVP), already irreparably split, is in the throes of another crisis. The old guard who are continuing to hold the reins of the party officially, despite the extremists gaining control of some branches, are locked in a new debate over leadership. 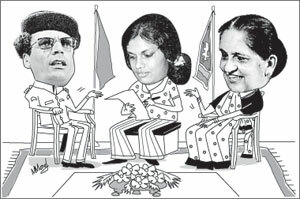 A recent meeting of the Central Committee saw calls for the present leader, Somawansa Amerasinghe to step down. He said the time was not opportune since the party was undergoing a crisis. A proposal was made that the JVP General Secretary Tilvin Silva be made the new leader. It was also proposed that the post of General Secretary be given to Bimal Ratnayake. That saw an angry response from the JVP trade union boss, K.D. Lalkantha. He said he had held the trade unions under the party together without any divisions. Hence, his contribution too should be considered when the issue of leadership was discussed. No decision has yet been made. Meanwhile, the extremist group is working hard to muster 5000 cadres to commemorate the death anniversary of Rohana Wijeweera. There is strong speculation that their elusive leader, Kumar Gunaratnam or Kumar Mahattaya as he is called would make his first appearance at the event. That would no doubt be a matter of interest to those in some law enforcement agencies who are on the lookout for Gunaratnam. The marauding elephant, a tusker, caused damage to 43 vehicles on the main highway at Kekirawa last week. There is a sequel to the incident that frightened motorists. Two police constables attached to an intelligence unit covering the area have been transferred out. The reason - they could not give advance warning about the threat posed by the pachyderm which had gunshot injuries on the body. Most environmentalists love green and evengreen grass. But this is the case of top cops insisting that the garden in one of their official bungalows be planted with imported grass. That is whilst renovation work is now under way. Eyebrows were raised when one of those in charge of the project said that the boss wanted Australian grass. So they have managed to get it and are now in the process of planting it. According to Administrative Report (2010) on the Prime Minister's office, 57 positions out of a total 197 positions had fallen vacant. This includes 13 vacancies in the permanent staff, 18 in the personal staff and 22 in the temporary staff. Consultant on Foreign Affairs and Assistant Secretary to the PM are two among the vacant posts. Addressing a literary festival at Biyagama last week Jathika Hela Urumaya stalwart Ven.Athuraliye Ratana Thera said he wanted to become a dancer during his childhood. He said he was fond of dancing. Even in his 'handahana' (astrological chart), it was said that he would be a great dancer one day. The monk was speaking at a ceremony where many dancing items were performed to mark the festival. The slaying of one time Libyan strongman Muammar Gaddafi has revived memories of his visit to Sri Lanka in 1976 to attend the Non Aligned Nations Summit. One story related to the problems faced in dealing with a huge security contingent that accompanied him. Finding them accommodation was a headache to the organizers. Another was keeping then Egyptian President Anwar Sadat and Gaddafi apart from each other. The two were arch enemies. Another problem was Gaddafi's refusal to speak in English at the summit. He wanted to converse in French. While the NAM was progressing, Gaddafi wanted to hurriedly arrange a bilateral meeting with Prime Minister Sirimavo Banadaranike. They agreed on a time but there was a snag. There was no translator.Then the problem was translation.The official translator who arrived with the former Libyan leader was attending the summit with the Libyan delegation. Chandrika Banadaranike,with her good knowledge of French, and educated at the Sorbonne University in Paris volunteered to be the translator at the meeting. No applications were called but the Prisons Department had received applications from at least twenty to become the hangman. This was after media reports that the post of hangman was vacant and was to be filled soon. When the post was earlier advertised no application was received. Some of the applicants have also spelt out their preferences. Prison officials say some have demanded housing and vehicles. They say that the posts would soon be advertised. However, those who have already applied too would be considered, they added. Bharathi Wijeratne, wife of Presidential Advisor Mano Wijeratne, who died recently, will be Sri Lanka's Ambassador to Turkey. She will be Sri Lanka's first envoy to that country and a new diplomatic mission is to be established shortly. Her father, the late Hema (Lofty) Wijeratne was the Consul General for Turkey earlier. She succeeded in that position and maintained close contacts with officials in the government of Prime Minister Recep Tayyip Erdogan. This will be Bharathi's second record. She became the country's first woman tea taster when her father was head of the tea department in a leading commercial house. Import substitution: Is it a pragmatic economic policy?